No tome on comic book law would be complete without its own heroes to help us fight through the tangled web of law that threatens to ensnare our creative efforts. It seems today that everyone and their mothers is making comics and that every studio and their mothers are making movies about those comics. However, with all of these comics and opportunities flying around, there are a few issues that could spell certain doom for aspiring creators, and I don’t mean back-issues. The book is now on sale at all major book retailers and online at Amazon and Focal Press, but I managed to pull Mr. Crowell to the sidebar to get some insight on his book and what it can teach us. 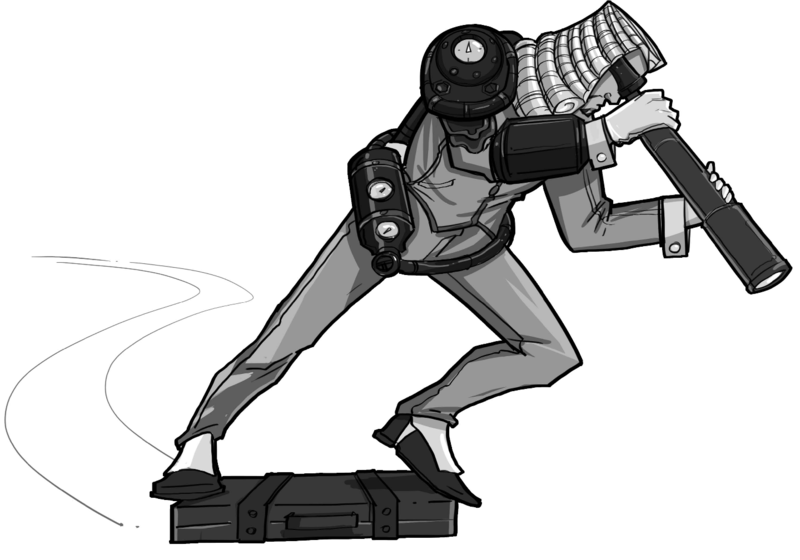 Q: What inspired you to make The Pocket Lawyer for Comic Book Creators? How did you get the idea for your unique presentation with the illustrations and comic strips rather than telling straight-forward facts? Crowell: Before I turned to the “dark side” and became an attorney, I was a television producer for many years. And I knew from experience that many artist-types run away from anything that smacks of legalese — usually to their detriment. I wanted to make sure that I could break down these difficult legal concepts into fun-to-digest, bite-size nuggets. And the best way to appeal to somebody is through their own medium. Plus I got a chance to write a comic book. How cool is that? This is actually my second legal guide for artists. The first is The Pocket Lawyer for Filmmakers (Focal Press 2011), which I’m pleased to report is one of the best-selling legal guides for Indie filmmakers on the market. My readers tell me that one of the things that makes Filmmakers successful is its accessibility. 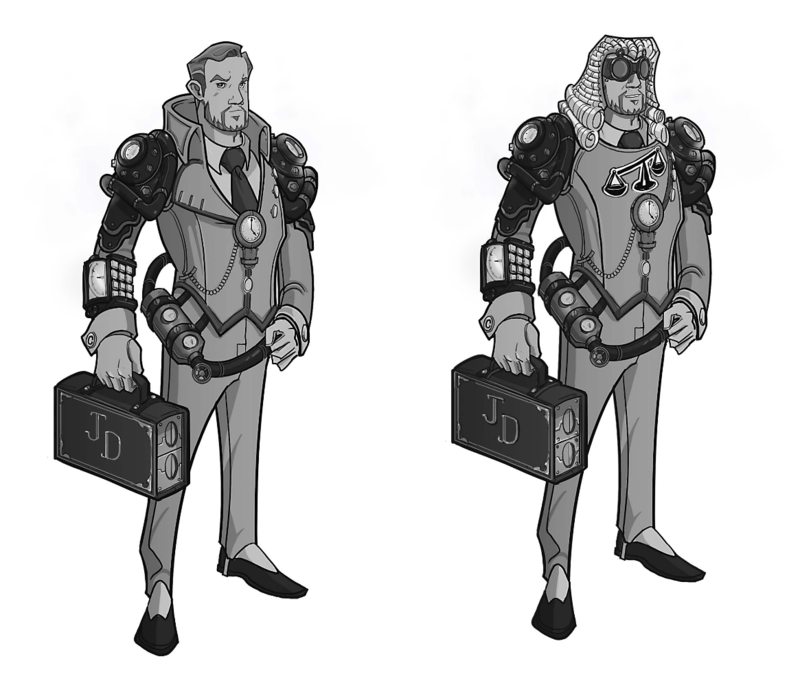 With The Pocket Lawyer for Comic Book Creators, I wanted to take those same tools that worked in the first book and raise it to a whole new level. Q: What do you think readers will like most about TPLCBC? Crowell: As I indicated, I hope that readers will find it accessible and easy to use. In addition to comic strips and fun artwork, I’ve also written the book in such a way that you can get the information you need without having to read it cover-to-cover. There are a lot of internal cross-references and an FAQ section at the beginning so you can literally open the book, hopscotch around and get the information you need right away. As much as I can, I’ve tried to keep the writing style very light. It’s full of examples featuring funny comic book titles (“Hypno-Robo-Zombie-Vampires-from-Venus”) and heroes (Super Lative: the World’s GREATEST Super Hero!”). It’s often a very fine line that I’m walking because, well, it is a law book and I do have to use actual contract language. I wouldn’t be doing the readers any favors if I oversimplified the language that they’ll actually be seeing when a publishing company hands them a contract. So in the book, you’ll see some very real examples of contract language. However, for each contract I’ve also included helpful explanatory comments, tips and tricks and legalese-to-English translations. In the back of the book, I have given the readers “an anatomy of a contract” where they can learn about the common comic book contract clauses that they are likely to encounter in the real world — my aim is to provide sort of a Rosetta Stone for comic book creators. OOH LOOK! A COMIC ABOUT FAIR USE! Q: What do you think TPLCBC brings to the table no other books on comics are bringing right now? 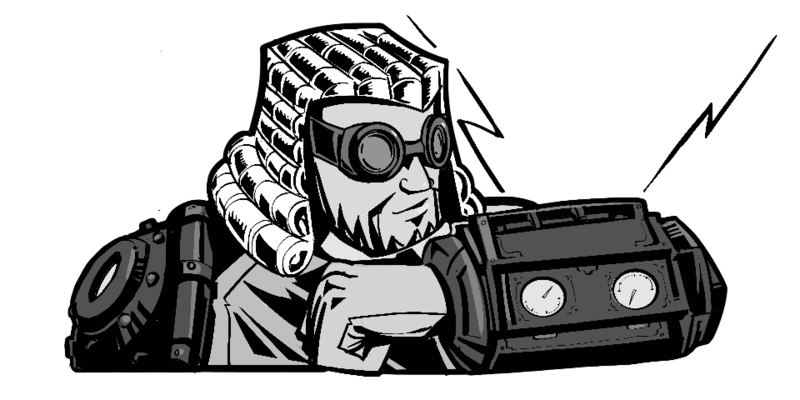 Crowell: Quite simply: it is the first dedicated legal guide for comic book creators. Period. There are a lot of books out there telling you how to draw and write comics and books that talk about the famous legal battles in comic book history. And even though some of those how-to books might have a chapter on comic book contracts, I can tell you that protecting the legal rights to your work requires more than a chapter written by a non-lawyer. Crowell: Hands down, my favorite part was creating comic book pages and characters! Q: There are many legal gray areas and potential pitfalls for beginning comic creators out there. What do you think is/are the most important of these that your book covers? Crowell: Without a doubt, the most important concept that comic book creators need to understand is how to protect the copyright to their work. I made sure to go into a lot of depth in the book on how to protect your copyright, and how to guard against the perils of losing control of your copyright. Without needing to seek permission from the writer! Of course, a written agreement can control for this; and luckily, I provide samples of such written agreements in the book. I also provide several actual comics in the book to explain these difficult concepts in true comic book style. Q: You mentioned that other books talked briefly about some of the comic industry’s biggest legal battles. Could you briefly explain what the major causes for some of these scandals are? Crowell: A majority of the big legal battles, for instance the one fought by Jack Kirby and Marvel, involve work for hire issues. Briefly, the copyright to a comic that is created at the instance and expense of employer is owned by the employer. In fact, the employer is seen by the law as the author of that comic! Even if the artist is not an employee of the publisher, if the artist signed a work for hire contract, it’s the same result — the artist is not the author, the contracting party is. Now, sometimes you’re not to get around the fact that you’re being hired as a work for hire artist, but the trick is to make sure that you get paid well (such as the royalty and a page rate) for the copyright that you are essentially giving up. WHAT’S THIS? A COMIC ON WORK-FOR-HIRE!? Q: Today’s digital age has made it easier for comic creators to reach out and find each other, but it has also made legal matters in most areas of life more tangled than ever. Does your book cover the potential dangers of online communication/collaboration? Crowell: Absolutely. Digital technologies have increased the ways in which creators can both collaborate and distribute their work directly to comic book readers. However, because of the ease of these technologies, it’s all too easy to lose track of the ownership in one’s work. 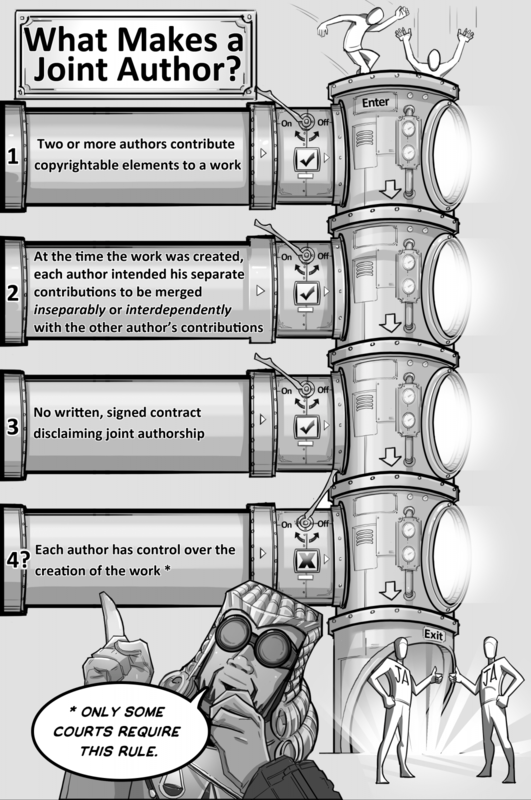 The Pocket Lawyer for Comic Book Creators shows its readers how to avoid some of the most common problems faced by creators, such as “collaboration sabotage.” For instance, did you know that if an artist and writer work together without a written agreement, copyright law considers them joint authors? That may sound fair — and sometimes it is — but each joint author can license the work to a third party without seeking permission from their co-author. So, for example, the writer may want to unveil the comic book pages for the first time as a published comic book for sale, but the comic book artist can go ahead and post entire pages online for free without seeking permission from the writer; and without a written agreement between the two, there’s not a lot the writer can do about it. Not only does the book teach you how to identify such problems, but it actually walks you through the creation of collaboration agreements that are easy to understand, and fair to all parties. AND NOW, A COMIC ON THAT VERY THING! Q: Who would you rather defend you in a court of law: Matt Murdock or J.D. Esquire, Hero-at-Law? Crowell: I suppose it would depend upon what I was in court for: if I was facing criminal charges, definitely Matt Murdock — he’s a criminal defense attorney. However, for something involving copyright, even Matt Murdock better retain the services of J.D. Esquire, Hero-at-Law! Again, the book is The Pocket Lawyer for Comic Creators and it is on sale now, available at all major book retailers. You can also find it online at Amazon and Focal Press. If you’re a comic creator yourself or need a holiday gift for someone who is, this could the most valuable book you can find. Court is adjourned.